The Samsung C24FG70 is a 24″ curved monitor with AMD FreeSync built in and a whopping 144Hz refresh rate. This is actually one of the first Samsung monitors for a while to run at 144Hz, a sign of the growing enthusiasm for gaming monitors among PC owners. The screen features a 1,800R curve which is actually relatively tight compared to the more gentle curves observed in the competition. Samsung claim that this provides a more comfortable experience for the user compared to a flat screen. 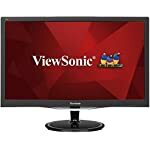 I’ve yet to try this monitor myself so I can’t comment, the curve does help on larger monitors but I wonder what the impact will be like on a 24″ screen. I do like the look of this monitor, it isn’t emblazoned with the typical game monitor livery, no go faster red stripes on this one. But what you do get is a very smart looking device that will look great in an office. The stand out feature is the, erm, stand, thanks to an articulated arm than can be manipulated in different ways to get the screen into the position you want. Whilst it makes adjusting the monitor easy enough there is a downside, as you lower the monitor the arm will stick out backwards which means it’s not going to be ideal if you want it pushed up to the back of a wall. You can hook up your PC using the two HDMI 2.0 ports or the single DisplayPort socket. A 3.5mm headphone jack is included but no USB hub. It’s not something that I would miss but perhaps you find it more useful. Thanks to the 144Hz frame rate the Samsung C24FG70 is going to feel fast and responsive assuming your graphics card can output frames at that rate. It is only HD resolution so a current mid range graphics card should be able to hit those rates, at least in older games. For the times you do dip below the max, FreeSync is there to ensure a smooth ride. This feature adjusts the frame rate of your monitor to the output of your graphics card to ensure low latency smooth tear free game play. You’ll need a compatible AMD card to benefit. Response time is quoted as 1ms but that seems ambitious for this panel type, it might be worth looking for clarification on this. The panel uses VA technology which is known for its deep blacks and high quality images, this model also features a Quantum Dot layer which I’ve been assured results in greater colour accuracy, more vibrancy and higher peak brightness levels. I haven’t seen this monitor in action yet so I’ll have to take their word for it. Professional reviewers report back great colour accuracy and contrast. Samsung include a mode called ‘Arena Lighting’ which apparently allows you to sync an LED light on the base of the monitor with the audio from games, imagine flashed from explosions for example. Sounds like a gimmick but I would be interested to hear from any owners who enjoy using this feature. A final mention goes to the Samsung blur reduction technology which has been getting very positive feedback from critics. Switching this on gives a marked improvement in fast action games with no noticeable downside. 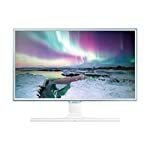 We give the Samsung C24FG70 a 4 out of 5 rating. Want to know what existing owners of the monitor think? You can read real user reviews here. 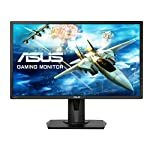 Should I buy the Samsung C24FG70? 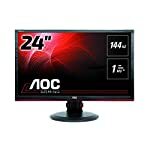 A 24 inch full HD game friendly monitor with a curved screen. 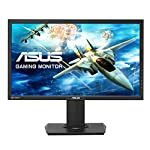 FreeSync and a 144hz refresh rate combines with the image quality from the VA panel make this an exciting prospect for anyone looking to upgrade right now. If you are having some doubts about this purchase then why not read some real owner reviews and see what other buyers think.